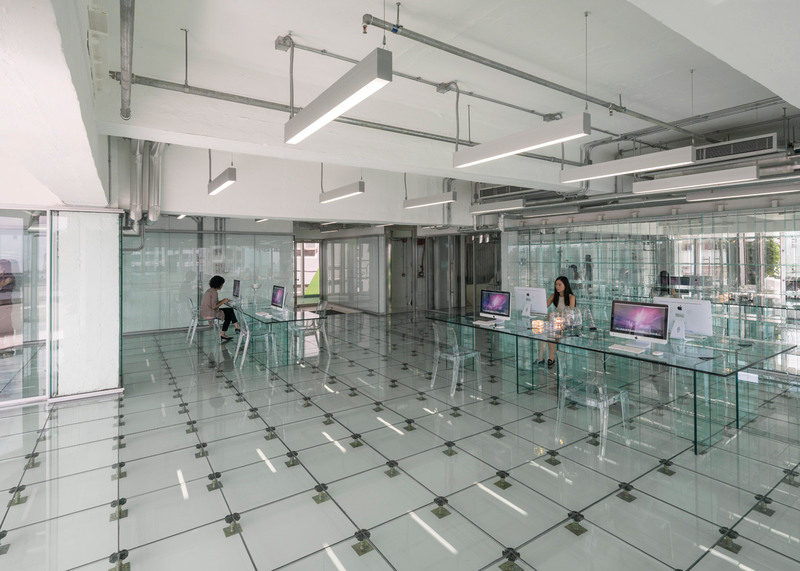 Transparent glass walls, floors and furniture all feature inside this office block, created by Dutch firm MVRDV in a stripped-out Hong Kong factory (+ slideshow). The Rotterdam-based firm completely overhauled the inside of the 13-storey structure, replacing all of the opaque partitions and floor surfaces with new see-through alternatives in a bid to make it feel more open and spacious. The result is a building without any dark corners, and with all of its inner workings exposed. MVRDV describes the process as revealing a "beautifully raw and butch primary structure", in order to give "ultimate transparency" to the workplace. 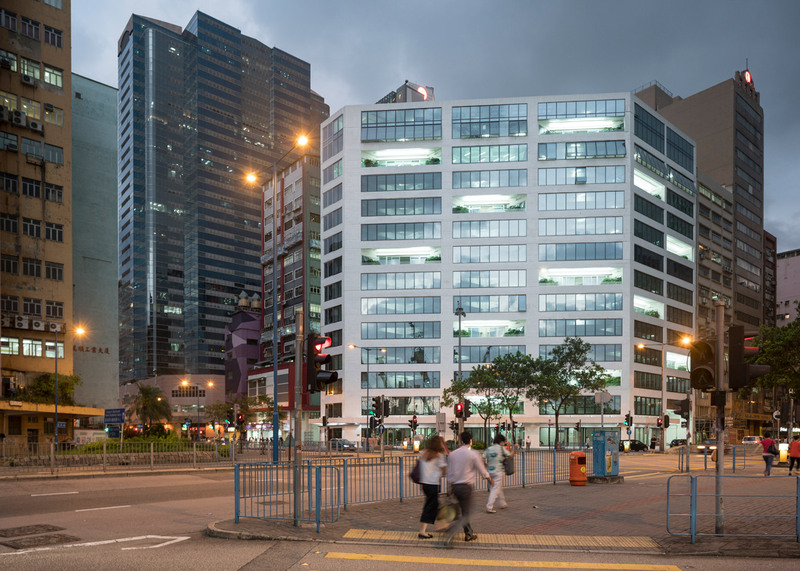 Now known as the Glass Office, the building stands on the Kwun Tong waterfront in Kowloon East, a post-industrial area that is rebranding itself as Hong Kong's new central business district. The aim is for the building to serve as a model for new business developments, proving that it is possible to transform an old structure into a functional and beautiful office. 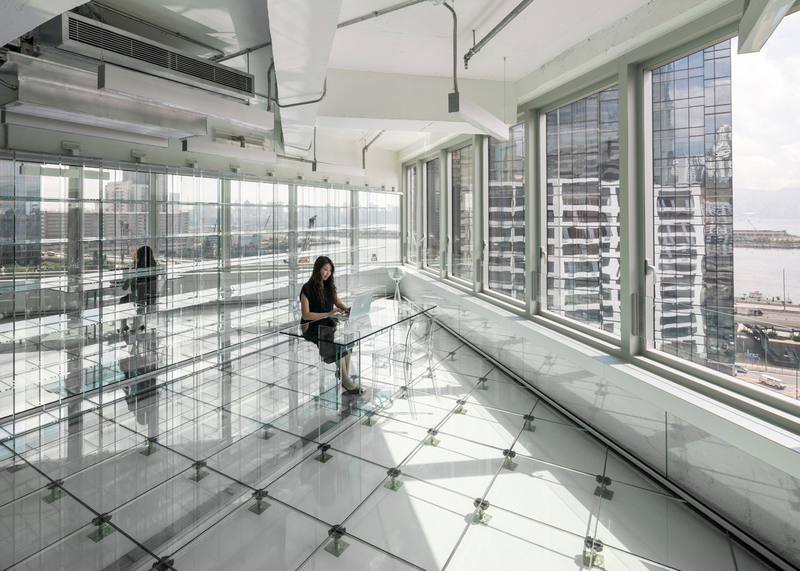 The architects see the use of glass as symbolic of the growing demand for transparency in the modern workplace. "We are moving into a transparent society, businesses are becoming more open with the public, and people care more about what goes on behind closed doors," explained MVRDV co-founder Winy Maas. "In that way, a clear workspace leaves nothing questionable, nothing hidden; it generates trust," he said. "But also it is an opportunity for the building to become a reminder of the industrial history of the neighbourhood, monumentalised in a casing of glass." 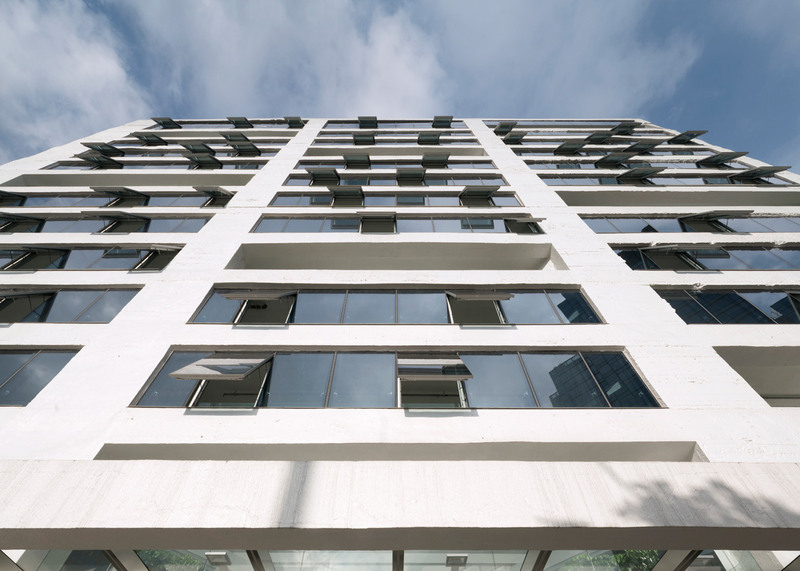 One of the first moves in the renovation was to strip back the building's rear facade to incorporate more glazing. Corridors, staircases, lifts and other communal areas were then moved to the back, making them much more visible from outside. Glass was used for all of these spaces – glass lifts are housed inside glass shafts, while the emergency escape stairs are encased in fire-resistant glass. The office floors, which can be kept open-plan or divided into four units, all feature glass floors and walls. There are no suspended ceilings, so electrical fittings and ventilation ducts are left exposed on the ceiling. MVRDV and local partner architect Arch-Innovativ have also furnished one show office. To continue the theme, they chose transparent desks, chairs and shelving – something they hope tenants will copy. 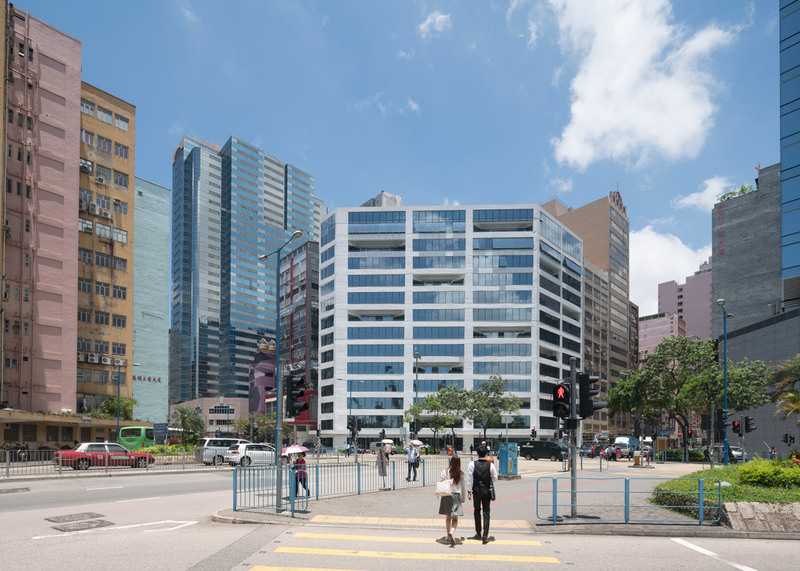 "The goal was to expose the inner workings of the building including the structure and installations, but not only this, to show the free-flow movement within the building, the inner-workings of the companies inside and the technical components which allow the office to function," said the firm. As well as offices, the building contains shops at ground level and two floors of restaurants above. A roof terrace and a series of balconies also feature, providing breakout spaces that encourage staff to interact with one another. 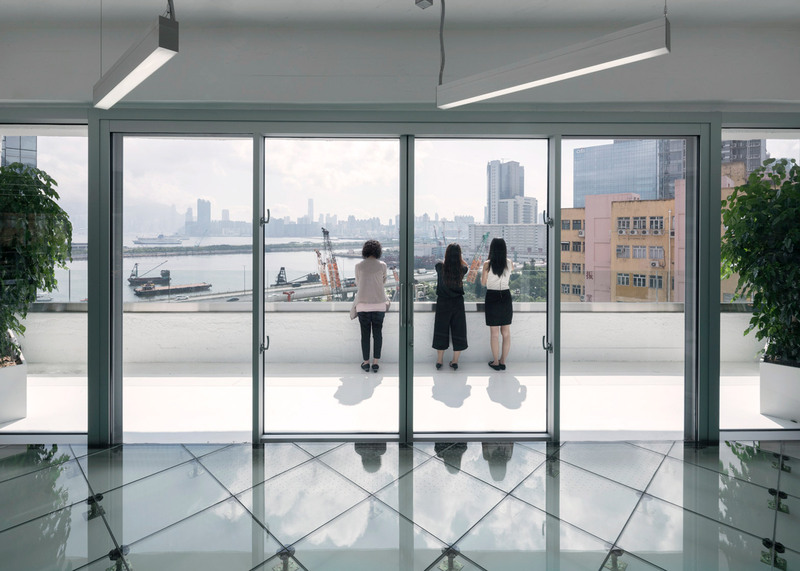 According to the architects, the building uses 17 per cent less energy than the average Hong Kong office, despite the large amounts of glass. The Glass Office is the latest in a series of MVRDV projects that look at alternative ways of using glass in design. The office recently unveiled a converted Amsterdam townhouse with a glass brick facade. Other completed projects include a library contained within a glass pyramid, a glass building disguised as a traditional farmhouse and a completely see-through kitchen.